Cotton Canvas / Numbered Ducks VS. Single Fill? Let's begin by clarifying one thing, "Cotton Duck" & "Cotton Canvas" are one in the same. Cotton duck is an industry term and cotton canvas is more of a consumer term. Named Numbered Ducks for the "#" like weave structure which is known as "double fill" or "plied yarn". Numbered ducks are identified by the "#" sign in front of a number from 1 to 12. This plied yarn weave makes for a tighter and stronger weave construction over single fill ducks and are used for more rugged outdoor or industrial applications. Numbered ducks will vary in weight from mill to mill and there is no real universal standard weight for each number. We have included our ounce weight per square yard in our product descriptions to lessen the confusion. #12 is our lightest weight numbered duck at 11.5 oz per square yard and #1 is the heaviest at 30 oz. Anything heavier than a #1 would would be considered a Naught Duck. As if it wasn't confusing enough, we also carry Army Duck which is technically a numbered duck as well but uses smaller plied yarns to produce a finer texture and better strength. Numbered Ducks are the primary product used for the differing textures of primed and un-primed artists canvas. 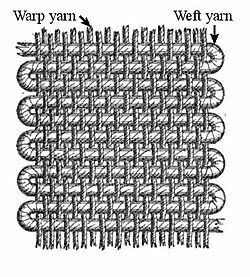 (Lighter weight #12 = finer texture - Heavier weight # 10 = more Texture) The tight weave of numbered ducks also makes it stiffer & less permeable to liquids, inks, paints etc. Making it a perfect choice for Canvas Tents, Upholstery, Tarps, Drop Cloths, Silk Screening, Digital Printing, Theatrical Back Drops etc. Heavyweight Cotton Canvas is also an attractive and economical solution for sound dampening/barriers in media rooms, studios, offices, schools or at home as wallcovering or a drapery. Single fill ducks are identified by their ounce weight. This weight is the approximate weight per square yard. For instance, 10oz duck is approximately 10 ounces per square yard. 1 square yard is 36" x 36 "
Single fill ducks are extremely popular for slip covers, crafts, bags, liners, table cloths, fleece lined jackets, & much more. DO YOU HAVE SPECIAL FINISHING REQUIREMENTS? WE CAN DO THAT TOO! Weather/Mildew Resistant WDR, Custom Dye Lots, Fire Resistant Coatings, UV. Military Specs. Available Widths - 36", 48", 60", 72", 84", 96", 120", 144"
We have colors available in #10 (15 oz.) and/or #8 (18 oz.). Call for availability.